After Memento Mori and Draco, Daniel Strom's third timepiece is a more angelic work… or at least less provocative in its form. 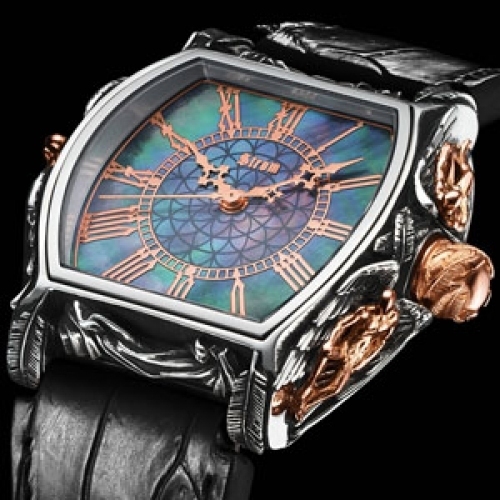 The watchmaker has instilled Archangeli with the spirit of his Agonium collection of watches that serve not only to give the time, but inspire us to reflect on our existence. Cast in an original mould, gold, silver, platinum and palladium are fashioned by hand. The Archangeli's sculpted case comes alive with detail. Feathers wrap themselves around the crown, a symbol reprised for the lugs. 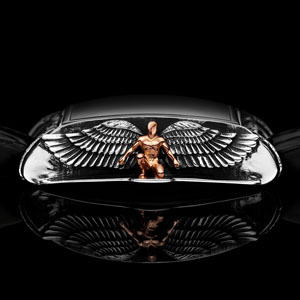 The sides of the case are adorned with reclining angels, and another crouched angel with wings spread. Protected by a sapphire crystal, the white or iridescent mother-of-pearl dial contrasts with the Roman numerals and gilded, polished hands. 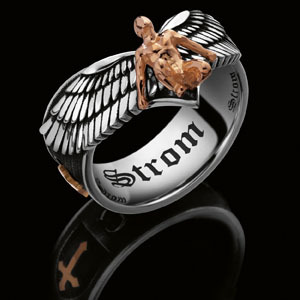 And because, in Daniel Strom's mind, a symbol is never set in stone, he extends his philosophy – this time with a hint of provocation, who knows – to a collection of rings with the same evocative name, Archangeli.